I have to confess to not knowing much about this mark. It appears Mr Powell was the frame builder at a previously famous shop named Overbury's, which has since ceased trading. Now digitally re-created and printed onto quality vinyl. Set includes 2 x down tube, 2 x seat tube each measuring 225 x 21 mm. Design is black with a white outline, other colours may be possible. 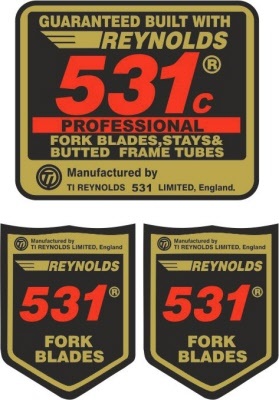 Each set can be supplied with a 531,653 or 753 tubing decal, if not specified by customer 531 will be sent by default. Famous UK builder and paint sprayer. One of Manchester's little known builders. Set includes 2 x down tube (180 mm x 27 mm), 2 x seat tube (160 mm x 24 mm). 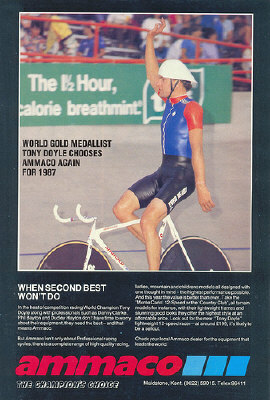 Taken from Chris Walkers's 1991 team issue bike. Set includes top tube, down tube, seat tube, head, forks, chainstays, seat stays, forks. 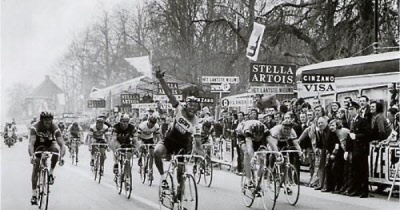 There were so many versions of this, depending on year and if the bike ewas a genuine team issue, or one of the thousands of replicas produced by Falcon. The originals were rather crudely screen printed onto a clear film and then dye-cut. These are digitally printed onto a white background and computer cut exactly at the edges, so no messy clear edges. 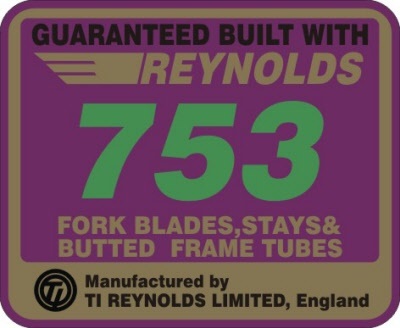 Some had 'Falcon' vertically on the forks, but this one had the Reynolds logo. Team colours only. Leggo's dream team! Great memories from the likes of Jonny Clay, Chris Lillywhite, Shane Sutton, Wacker Walker, Rob Holden, Keith Reynolds and later on Brian Smith. Set includes 2 x down tube (185 mm x 31 mm), 2 x seat tube(Shimano) (157 mm x 20 mm) 2 x forks(Falcon) (28mm x 120 mm), 2 x top tube (Team Banana)(200 mm x 18 mm), 1 x chainstay (Team Banana)(150 x 13 mm). Set includes 2 x down tube (150 mm x 33 mm), 2 x seat tube (150mm x 33 mm), 1 x headbadge 40 mm x 59 mm). Please note: headbadge is printed from old photograph and should be treated with care. Best to apply and lacquer over. Set includes 2 x downtube (200 x 30 mm), 2 x seat tube (200 x 30 mm), 2 x forks (111 x 14 mm). Also includes replica tubing decal (choice of 5). Little known shop based in Leeds, frames built by Paul Donohue (amongst others). Set includes 2 x down tube (214 mm x 30 mm), 2 x (181 mm x 25 mm) 1 x headbadge 42 mm x 60 mm). Please note: headbadge is printed from old photograph and should be treated with care. Best to apply and lacquer over. Set includes 2 x down tube (185 mm x 25 mm), 2 x seat tube (151 mm x 35 mm), 1 x head badge (52 mm x 25 mm). 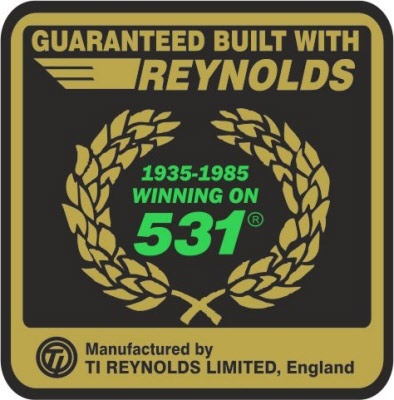 Can be supplied with replica tubing decal id desired. Set includes 2 x down tube (267 x 25 mm), 2 x seat tube (182 x 27 mm), 2 x signature (79 x 18 mm), 2 x worlds bands, 2 x head (1 for upper seat tube) Design is blue, other colours may be possible. 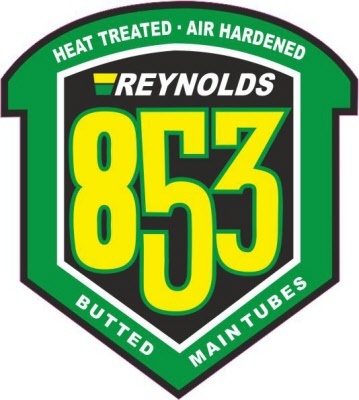 Each set can be supplied with a 531 (set),653 (set) or 753 (single) tubing decal. Liverpool builder, started with Harry Quinn, before starting his own frame building. Set includes 2 x down tube (250 mm x 25 mm), 2 x seat tube (210 mm x 20 mm). Digitally re-produced and printed onto quality vinyl. Set includes 2 x down tube 2 x seat tube. Optional tubing decal. Set includes 2 x Dawes (280 x 30 mm), 2 x Sadar (145 x 15). Classic Liverpool builder, leaned his craft from none other than Harry Quinn. Set includes 2 x downtube (210 x 28 mm), 2 x seat tube (210 x 28 mm),1 x head (59 x 38 mm). Also includes replica tubing decal (choice of 5). Used on early steel frames. Set includes 2 x down tube (206 mm x 39 mm), 2 x (165 mm x 30 mm) 1 x headbadge 40 mm x 70 mm). Please note: headbadge is printed and should be treated with care. Best to apply and lacquer over. One from the 'Ellis Briggs' stable. Set includes 2 x down tube (216 mm x 33 mm), 2 x seat tube (169 mm x 30 mm), 2 x headtube (85 mm x 15 mm). Set includes 2 x down tube (240 mm x 25 mm), 2 x seat tube (195 mm x 27 mm). Classic Henry Gregson frame decals. As far as my memory serves me, Roger Haydock aquired Henry Gregsons shop in Accrington, Lancs and continued to build frames in his own name and Henry Gregson's. Now sadly no longer there, last I saw it was an Indian Restaurant!!! Set includes: 2 x down tube (234 x 25 mm), 2 x seat tube (221 x 25 mm), 1 x headbadge (50 x 63 mm). Many frames were built in 531, and this set comes with replica tubing decal of your choice. Set includes 2 x down tube (225 mm x 25 mm), 2 x seat tube (180mm x 20 mm), 1 x headbadge 45 mm x 54 mm). Please note: headbadge is printed from old photograph and should be treated with care. Best to apply and lacquer over. Set includes 2 x down tube (168 mm x 29 mm), 2 x seat tube 119 mm x 20 mm), 1 x headbadge 59 mm x 67 mm). Please note: headbadge is printed from old photograph and should be treated with care, and will be black on white regardless of word lettering. Best to apply and lacquer over. Set includes 2 x down tube (258 mm x 28 mm), 2 x seat tube (181 mm x 20 mm).